TORONTO. Welcome to Ontario’s capital. Your Tour Director is on hand late this afternoon to answer any questions. TORONTO. EXCURSION TO NIAGARA FALLS. Skirt the shores of Lake Ontario to Niagara Falls, one of the Natural Wonders of the World. Board your SIGHTSEEING BOAT for a thrilling ride to view the thundering falls. Sightseeing also includes the beautiful Floral Clock and the city’s major landmarks, such as the banking district, City Hall, the CN Tower, the University of Toronto, and ultra-modern Roger’s Center. This evening, enjoy an optional outing to the top of the CN Tower for a delicious dinner and spectacular views. 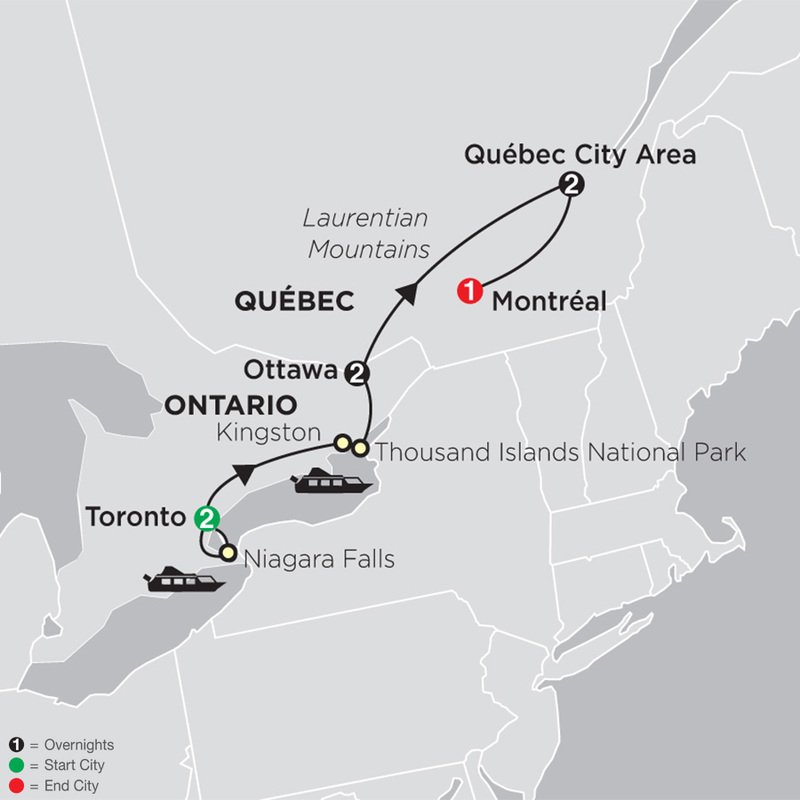 TORONTO–KINGSTON–THOUSAND ISLANDS NATIONAL PARK–OTTAWA. Leave Ontario’s capital and stop in Kingston, a city with an exciting history dating back more than 300 years. Proceed along the St. Lawrence River with splendid vistas of Thousand Islands National Park. At Ivy Lea, board your boat for a CRUISE that takes a scenic route through the many islands of St. Lawrence Islands National Park. Next, head to Ottawa, Canada’s beautiful capital. OTTAWA. This morning, enjoy a sightseeing tour of this lovely city on the banks of the Ottawa River and the Rideau Canal. See the Canadian Mint; the embassy district; and stately Parliament Hill. Visit the ROYAL CANADIAN MOUNTED POLICE STABLES, a tribute to Canadian heritage and history. Suggestions for this afternoon include a visit to the magnificent Canadian Museum of History or the array of restaurants and shops at lively Byward Market. OTTAWA–QUÉBEC CITY AREA. Drive into the French-Canadian province of Québec for a sudden change in language and tradition. Follow the historical King’s Highway along the north shore of the mighty St. Lawrence River. Visit the BASILICA OF NOTRE DAME DE CAP DE LA MADELEINE before arriving in Québec City, the heart of French Canada and a UNESCO World Heritage Site. QUÉBEC CITY AREA. Enjoy a guided tour of Canada’s only walled city, crowned by the turrets of Château Frontenac. Until the British victory of 1759, Old Québec was the center of New France; today, it’s a UNESCO World Heritage Site. Within the walls resides Place d’Armes, Laval Seminary, the star-plan Citadelle, and ancient Place Royale. Also, see the stone houses crowding the narrow streets of Lower Town by the St. Lawrence River. The afternoon and evening are free—your Tour Director will have suggestions for sightseeing, shopping and dining. QUÉBEC CITY AREA–MONTRÉAL. This morning, join a unique optional excursion to the Érablière le Chemin du Roy Sugar Shack. Visitors to the sugar cabin will enjoy a typical Québec breakfast, along with a guided visit and presentation to explain the process of maple extraction. Afterward, head south for sophisticated Montréal, one of Canada’s largest cities. Major attractions on this afternoon’s guided tour include once-walled Old Montréal, the Seminary of St. Sulpice, Mount Royal, and modern Montréal. MONTRÉAL. Your vacation ends this morning. "Originally from London, I worked at a hotel in Germany and as a Local Guide in northern Italy before becoming a Tour Director. I have conducted tours all over Europe, North Africa, Asia Minor, Scandinavia, Eastern Europe, Russia, South America, and all 10 provinces of Canada. Today, I call Toronto home. I love to cook, process the pictures I take on tour, and read. Every day, I wake up and have a wonderful, learning experience awaiting me."